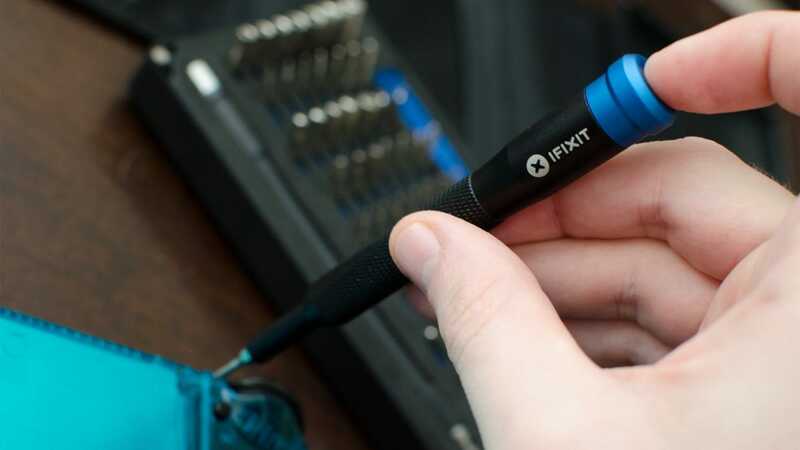 Unlike a standard home repair toolkit, iFixit specializes in kits to repair electronics. 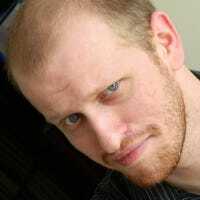 The company has an extensive catalog of detailed repair guides for smartphones, tablets, game consoles, and tons more. Each guide specifies how hard it is to do the repair and what tools you’ll need to do it. Take a look at any given guide, though–say this one on how to replace an iPhone X battery–and you’ll quickly realize how few of those tools you have. Fortunately, almost everything you need is in the Pro Tech Toolkit. 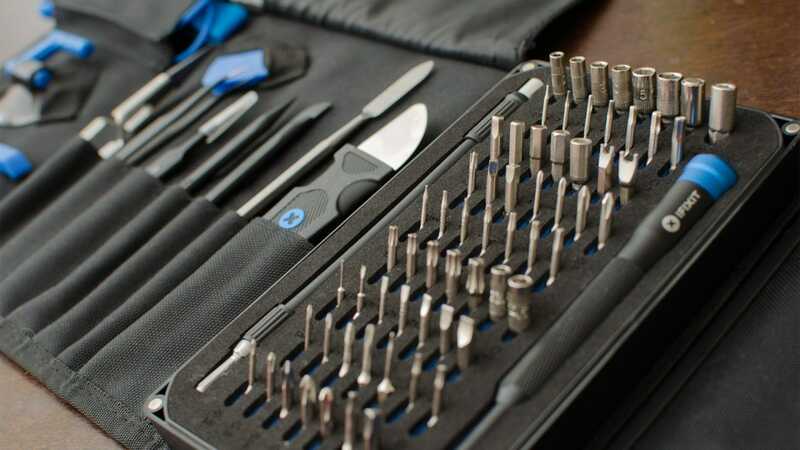 The iFixit Pro Tech Toolkit ($65) isn’t your ordinary toolkit. Since iFixit has spent years tearing down and repairing gadgets, the company has a pretty solid idea of which specialty tools you need most often. This particular kit is iFixit’s mid-range model. It has more tools than the Essential Electronics Toolkit ($20), which in my experience wasn’t quite as robust. You can also get the Repair Business Toolkit ($240) which, true to its name, is really more suited for someone who hopes to start a side business repairing electronics. For your average home electronics repairs, it’s overkill. The Pro Tech Toolkit, however, is perfect for a home user. Tri-Point and Pentalobe screwdriver bits. Modern electronics like the iPhone or Nintendo Switch use special screws with three or five points, as opposed to a standard Philips screws with four points. Even some typical screwdriver kits don’t include these, so it’s nice that iFixit’s kit has both. And in multiple sizes, to boot. There’s also a SIM card eject bit so if you lose the one that came with your phone, you can use this kit to swap SIM cards. Specialty and legacy bits. It’s not just modern bits this kit covers. It includes a range of obscure bits, from the gamebit fastener used in old Nintendo consoles like the SNES, to the oval head bit used in Nespresso coffee machines. It even comes with a magnetic bit you can use to grab tiny screws that you dropped or that are hard to pick up. No matter what gadget you need to take apart, there’s a good chance that whatever bit you need is in this kit. A selection of pry tools. If you need to take apart compact devices like a phone or tablet, you’ll need more than just screwdrivers. Pry tools are important for separating components that are glued together. There are multiple tweezers and spudgers to pull apart electronic bits. It comes with three plastic opening tools and five plastic opening picks. They’re purposely made of lighter plastic so they should break before you apply so much pressure that you would otherwise break your gadget. If you need a more powerful pry tool, there’s a metal jimmy tool you can use to separate pieces. A light-duty suction cup. In some cases, you’ll need to pull glass components apart from the components they’re glued to. Pry tools can help but if there’s no place to slide a pry tool in, a suction cup is best. The included suction cup isn’t going to pull dents out of your car, but it’s strong enough for some light repairs. Anti-static wrist band. Anytime you’re operating on electronics, there’s a risk that static electricity in your body could build up and accidentally fry your gadgets. For that reason, you should always use an anti-static wrist band when you’re working on electronics. Wear the strap around your wrist, and connect the other end to a large piece of unpainted metal. If you’re opening up a computer, then the case should do. A magnetic metal sorting tray. When you’re taking apart electronics, you’re going to end up with a lot of little pieces that can get knocked away or disorganized. This is where magnetic screw trays can come in handy. Conveniently, the iFixit kit has a metal plate that the screwdriver kit sticks to. When you take the screwdriver case out, you can place your screws on the plate to keep them organized. When you’re done, stick the case back and it sticks to the magnetic plate and stays in place. You can read more about the specific tools in more detail at iFixit’s site here. Suffice to say, if you’re opening up a gadget, there’s a good chance you won’t need anything outside what’s in this kit. The kit as a whole is more expensive than, say, buying a Tri-Point screwdriver if you only need that. However, if you spring for the kit, it’ll probably be the last time you’ll need to buy tools to work on electronics. The entire kit comes in a polyester canvas case that folds up and closes with velcro. This is distinctly different from most toolkits that are housed in some form of plastic. The canvas case is less likely to get cracked or broken. Plus, it looks a lot nicer. In a previous article, I talked about the case mod I applied to my Switch. I took apart the console and both Joy-Con controllers and replaced their casings with a sweet, transparent Ice Blue shell. This process was a bit more involved than opening up a desktop PC. Fortunately, every tool I needed was in the iFixit kit. For starters, the external portions of the Switch were sealed with Tri-Point screws, which posed no problem thanks to the bits in the screwdriver kit. The Joy-Con posed the toughest challenge. On top of the specialized screws, I had to gently release and unplug several extremely tiny ribbon cables (thanks tweezers), and I had to gently pry the battery out of its case where it was stuck in with double-sided tape (thanks spudgers). Oh, and of course the anti-static wrist band made sure I didn’t fry my favorite console while I was opening it up. Case modding a Switch isn’t quite as difficult as repairing a cracked iPhone screen or replacing your phone’s battery. Aside from the small amount of double-sided tape, I didn’t have to do any major adhesive removal like you might need to do on a smartphone repair job. However, if I did need to, I’d have the tools to do it. I’ve had to buy separate parts and tools over the years to open up gadgets, but this was the first time I felt like I had everything I needed in one pack. You could set your TV on a stand in your living room, but if you want a really clean look with minimal clutter, a wall mount will be even better. These are our favorite wall mounts.